I know, I missed Festivus. But the fact is, I’ve got a lot of problems [for] you people. And now you’re gonna hear about it. The Better Fans. ..even though that opens me up to the “I’m a better fan than you” narrative. And frankly, I don’t care. I’m a grown-up who paid for my own tickets and I’ll come and go as I please (to/from the stadium; not from my seats so as to keep from bothering my fellow fans whilst the puck is in play.) Seriously, the “better fan” mantra is as old as the internet; I think it first appeared the very day that Al Gore invented this place. Just stop. We’re all fans. The Music Has To Stop. No, no, I’m not telling them to stop playing music and I’m not even going to say which songs should be played. Play the stuff the kids want to hear these days or old stuff or whatever. But PLEASE stop the music when the puck is about to be dropped. I know the refs double-pumping the face-offs can be annoying to all of us, but the fact that the music continues a few seconds into play, and then fades rather than cutting off, tends to blur the line between “puck in play” and “puck not in play.” And the problem with that is that it makes it harder to teach folks when it’s OK to walk down the aisles from the concourse and when they should wait for the next stoppage. Don’t even get me started on the ushers with this–they need all the help they can get. If a goal is ever scored off the face-off no one will ever see it. Those in their seats will be blocked and those standing around and dancing to the tunes will be too busy watching themselves on the big screen to know what happened. I need better delineation between timeout partying and the hockey. The Much-Needed Standings Point. Every loss by overtime goal or shootout is always followed by the press release proclaiming the acquisition of the “much-needed standings point.” At the end of the season if it makes a difference in seeding or for playoffs, then sure. But every. single. time? And why are there three standings points available in an overtime game but only two in a regulation game? Go to the soccer way where a regulation win is worth three, and the overtime/shootout split is still 2/1. And a loss is a loss–sometimes the glass is half empty–don’t be afraid to say it. Or just bring back ties. Flyers Fans. Flyers fans need to calm down with their call-up demands. Players will arrive in the NHL when they’re ready. I’m glad Carter Hart did OK, because he was really shaky here for a while, and if he started playing that way in Philly, they would’ve eaten him alive. It’s just as bad on the baseball side. You say you want to see young players develop, but then you’ll be bored in two seconds when they invariably struggle, because they’re not ready. I know, they don’t really have any say in the matter. I’m just sick of reading it. Get in your car and drive to Allentown for a hockey game if you want to see the kids play. It’s a good time, I promise. Flyers Media. Speaking of stuff I’m sick of reading. I’ve currently un-followed all the Flyers media who have been live-tweeting the Phantoms games from watching them on AHL.tv rather than in person. Seriously, I’m at the game. Don’t fill up my timeline with stuff I already know and you can’t add any value because you’re NOT HERE. You wanna find your way north once in a while and do a Phantoms piece when you get bored with all the Flyers storylines? Fine. That’s what happens in baseball. The writers catch the “IronPigs Flu” twice a year and pop up for a fluff piece when they run out of Phillies ideas. Jersey Auctions. I really hate that it’s a profit center, but we’ve been over that. We’ve got one tomorrow and I’m sure the prices will be astronomic. But that’s fine. It’s Econ 101. Supply and demand. Something is worth whatever someone else is willing to pay for it. It’s not worth all the whining, belly-aching, and hand-wringing. I do find it strange that the profit-hungry powers that be don’t figure out that you can sell a $100 version of the thing for four months and it won’t really impact the prices of the game-worn/autographed versions because there are a limited amount of people interested/capable of being involved in that. Just make the money from the masses and add it on! It’s myopic. Comments: Once again I’m going with the PCT version of the standings rather than the points, due to games in hand. I’m not trying to sugar-coat it for the Phantoms, but what’s fair is fair. The Phantoms are still unbeaten in regulation (3-0-0-1) in the Kerry Huffmann era. Word from sources suggests that the players really love playing for “Huff” and are happy with the current situation. This was confirmed by THIS PIECE which came out last night. As we learned yesterday, “acting” head coach Kerry Huffman has been “promoted” to “interim” head coach of the Phantoms for the remainder of the season. Former head coach Terry Murray was brought back to be his assistant. This mean that Scott Gordon will remain with the Flyers in some capacity even should he give way to a new head coach in Philadelphia before the end of the season–which seems very doubtful at this juncture. Regardless of his record with the Phantoms during the lean years, that dude Murray knows some stuff about hockey. Look up his resumé if you want. He’ll be an excellent resource for Huff. With roster freezes and NHL hiatus and all of that over the holiday week, not a ton has happened roster-wise. However, there was an injury to Patrick in last night’s game in Tampa. We’ll await any fallout from that, but with Gordon in Philly now we know how that injury information gets protected. There has been much speculation that the new GM with the Flyers will start to makes some moves such as call-ups (Myers and Friedman have been mentioned) and trades. We’ll see if any of that speculation comes to fruition. We did get a semi-update on rookie winger David Kaše. He’s said to be improving and could start to be available after the first of the year. It’s been confirmed that forward Cole Bardreau has re-injured his surgically repaired hand from last season–at least that’s the way it was told to me by two different sources. We wish him well and anticipate more of a long-term recovery. Blue-liner Sam Morin,‘ who is on the Flyers’ DL, traveled with the NHL team this week and has been working out quite a bit on the ice. He is still on schedule for a February return. 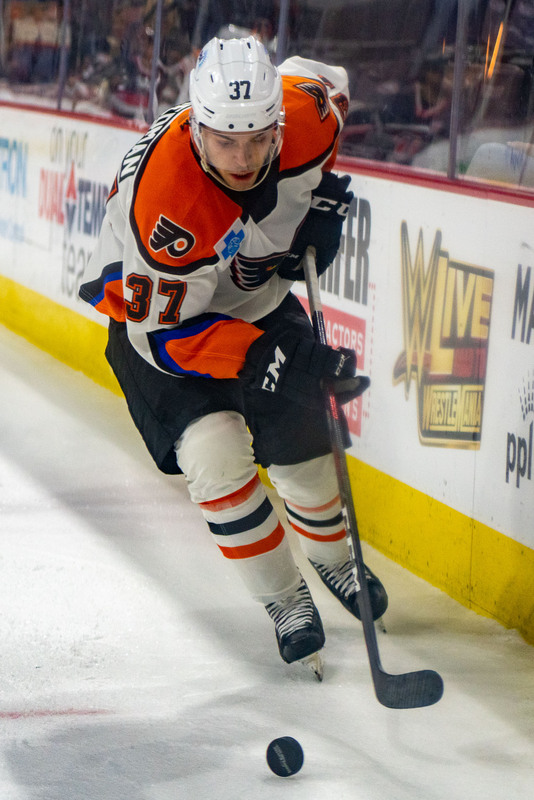 You can almost guarantee a “conditioning” assignment–the two-week variety–with the Phantoms once he’s ready. If he does well, he’ll be back with Flyers. If he does horribly, they’ve got a better chance of sneaking him through waivers to the Phantoms. So we’ll see–you can also bet they won’t want to start that clock until they’re sure he’s really ready. Things have been relatively stable recently under interim head coach Kerry Huffman. The roster itself has been pretty stable, too, which has helped. Some of this stability is perhaps helping with recent success. Comments: Bunny continues to earn his spot in that top group. Twarynski (skeeter? help me, what’s his nickname?) is also responding well continuing to work with Misha and Leiersy. The young guys Myers and Friedman continue to push towards call-up, while the veterans Samuelsson and Palmquist have contributed more of late, showing that they’re becoming accustomed to the Phantom way. And Lyon? Well, Huff has ridden him hard and put him away wet, but he’s responded. I told you he might have a chip on his shoulder and I’m sure to a certain degree he wants the work–wants it to be his net. He’s certainly earned it. The P-Bruins are in town for the first of two “Fifth Anniversary Celebration” games this weekend, with Scranton arriving tomorrow. Friday November 16 up in Providence the Phantoms won 5-4 after giving up four goals in the first period. Anthony Stolarz relieved Carter Hart in net. Philippe Myers had the winning goal. Saturday November 25 the Bruins returned the favor with a 6-3 beat-down largely at the hands of returning player Austin Fyten, exacting his revenge. Carter Hart was the goalie that night backed up by Austin “Savesa” Lotz. The Bruins have been shuffling some D-men as they lost one to World Juniors. #30 Dan “Darth” Vladar and #31 Zane McIntyre are the goalies. The Bruins last played last Saturday in Springfield in front of Vladar, so I’m looking for McIntyre tonight maybe. He’s not been as sharp as usual this season. However, the Bruins are a dangerous team, as we found out over Thanksgiving weekend. The Phantoms will wear their “Fifth Anniversary” white jerseys tonight. They’ll be worn again tomorrow and auctioned off after the game. After that, remember we’ll be at “Dark At Home” status with the AHL schedule–this time meaning we’ll be wearing mostly the orange shirts, as the new blacks have been given the “alternate” moniker. I mean, as far as I know. We’ll see. I’ll be in black tonight because it’s Friday. Good seats still remain for both tonight as well as tomorrow night’s game versus the Penguins. Tomorrow looks like the busier night. There are some holiday package promotions available as well, if you’re looking for multiple seats. Contact the team for details. We’ll see if they have any other “retrospective”-type stuff in store for us tonight and tomorrow as we recognize five seasons of hockey at the corner of 7th and Hamilton in downtown Allentown. Man, it’s gone fast! Watch the effort. 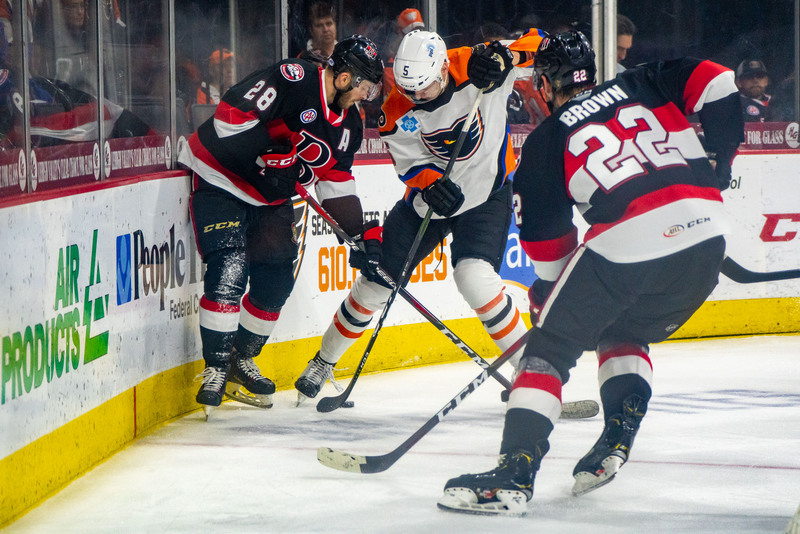 The Phantoms gave up a couple last-seconds goals at the end of the first and second periods Wednesday night in Wilkes-Barre. Watch to see that that doesn’t happen again. Also watch to see if you think the team is playing harder for Coach Huffman and new/old assistant coach Terry Murray. If you haven’t already, go read Tony’s piece HERE on what happened between Coach Gordon and Will O’Neill last season. It gives some insight into Gordon’s coaching style. That hard-a** routine can get players to play hard–but it can also wear thin after a while, especially with veteran players. It’s also something to consider going forward as we observe how the Flyers respond to Gordon’s coaching. It’s been great so far, but will it last? We’ll see. It seems like the deHaas deal is becoming a self-fulfilling prophecy at this point. He hasn’t been playing–then when he does play he’s rusty and doesn’t do well, so they don’t give him any more opportunities. I feel bad for the kid, and hope he can get out on the ice soon. If indeed a Myers or Friedman call-up is in the works, he’ll have all the ice time he can handle, soon enough. Watch the screen. I’m hoping they show us some great highlights from the past five seasons. …tomorrow night. The Penguins affiliate arrives for a Saturday-night throw-down. You can bet they weren’t happy how Wednesday night turned out, and although Leier and O’Neill didn’t go at it again, that will still be something to watch out for. And by the way, when was the last time we won a game when a post-game event (ie Jersey Auction) was planned? 1. The Phantoms need to play that “stay in your seat during play” several times. Fans leaving seats & walking up/down the steps during play is getting ridiculous. The ushers (for the most part) are worthless. Here’s a thought: fans who leave during play should be addressed by ushers at the top of the steps. One exception is if someone has a child with them — when they have to use the bathroom, it’s NOW. But NOT the guy on his fourth beer in two periods…or the gal who wants to chat with someone on the steps. And how about putting up that “stop sign” when the clock goes to ZERO? Anticipate the start of play to prevent people from heading down the steps. Not a hard task. 2. Dancing in front of us has become highly annoying. If you are a grown-up, STOP doing the “floss” in the seats or aisle. You look ridiculous, and you annoy every single person around you who really wants to watch the game. 3. If the Phantoms staff hands out big signs to folks, they should instruct folks to SIT DOWN immediately when the puck goes back into play. It’s unfair for everyone else to have to wait till they figure it out — or instruct them ourselves. Really, it’s all about respecting other fans. If these issues were addressed repeatedly, eventually folks would figure it out.